I have been a part of the Daring Bakers for 3 months now. It is rather well-established community of, ahem, daring bakers, which I am loving being a part of. There are monthly challenges, hosted by different members of the community, which really challenge the bakers to stretch their culinary skills and learn many new things along the way. At least that is true for me. I am guessing people like macaron-goddess Meeta, who have been a part of Daring Bakers for a number of years might find the challenges easy by now, but I still have a long way to go before I reach that point. After trying my hand at making Italian desserts Cannoli and Tiramisu past two months, this month I got to learn a French dessert as well called the Tian. Tian is essentially a layered casserole dish, mostly savory, but lately it has been interpreted to be sweet as well. This recipe of the Orange Tian I followed for the 2010 March Daring Baker’s challenge was hosted by Jennifer of Chocolate Shavings. 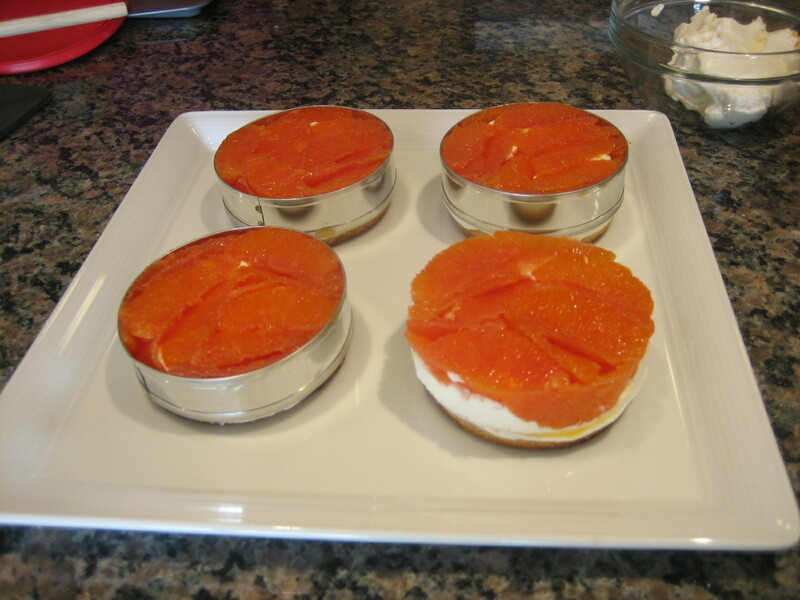 She chose Orange Tian as the challenge for this month, based on a recipe from Alain Ducasse’s Cooking School in Paris. The challenges usually require us to follow certain form but still allow for experimentation with and creation of new flavor combination but for this recipe, as with the two before, I decided to stick with what the hostess had provided, preferring safe steering over exciting action. I felt that there will be plenty of time for creative action in the time to come and even being able to create the dish as it was supposed to be was rather exciting for me. As is the case with most delectable desserts, there were a number of parts to the tian which were then assembled together as a final step. The base of the dessert is made of pâte sablée, which is a rich and crumbly French pastry crust. I made the dough for mathri (recipe forthcoming) in the morning and when I was making the dough for the pâte sablée later that day I realized that how similar in texture the two doughs were because of similar flour to fat ratios. The fat that makes the mathri flaky also makes the pâte sablée crumbly. This base is spread with some home made marmalade. The next layer is flavored whipped cream and the top layer is the orange segments soaked in caramel sauce. The interesting part about this dessert is that it is constructed upside down and then over turned for a super neat presentation. I don’t think it is possible to make this neat of a tian without doing the upside down flip. The recipe asked for a food processor but I don’t have one so I just used my hands to make the dough for the pâte sablée. I am guessing it might turn out better in the food processor given that the butter doesn’t melt faster due to the heat of the hands but the result for me was rather good as well. I don’t usually sift the flour but if you feel that your flour is not very fine, you could sift it with the salt and the baking powder. Then the idea is to cut the butter in the flour till the fat is well distributed among the flour particles. Try not to work the dough at this stage too much in any one spot in order to keep the butter fairly cold. In another bowl, mix the rest of the ingredients with a whisk or hand mixer till the egg yolks turn pale and the wet ingredients are well mixed together. Pour the wet ingredients into the the dry ones and make a dough with it. The recipe said that I might need to add a couple of drops of water to get the dough together but mine was a rather thirsty dough and I think I must have added at least a quarter cup of water, perhaps a little more before the dough came together as a homogeneous ball. This ball then needs to rest in the refrigerator for 30 minutes covered by a plastic wrap after which it will be ready to be rolled to about a quarter inch thickness, cut into desired shapes, placed on a cookie sheet lined with parchment paper and baked at 350 degree F for about 20 minutes. In order to cut the pâte sablée into the desired shapes, I got a set of 4 english muffing rings from Sur La Table which worked out really well as the base to assemble the tian as well. Slice the orange into fine slices and put the slices in a pot with cold water. Bring the water to a simmer and blanch the slices for about 10 minutes. Drain the water and repeat the blanching procedure two more times. This process is done to ensure that any bitterness in the orange peel is drained away. Once blanched, drain the slices and let them cool. Once they are cool enough to handle, process the orange slices in a blender or finally chop them with a knife if you would prefer. Use about the same weight of sugar as the orange slices. I didn’t want my marmalade too sweet so I used a little less sugar. In a pot, cook the minced orange along with the sugar, orange juice and pectin till it reaches jam consistency (about 10-15 minutes). Don’t wait for it to get really jammy because it will set as it cools as well. Mine ended up being too thick and then it was hard to fold it into the whipped cream. This was my first time making caramel sauce it was so fascinating to see how sugar behaves under duress (higher temperature, that is). Heat the sugar on medium heat till it starts to bubble and froth. Slowly add the orange juice and remove from it when it starts boiling. Pour half of this sauce over the orange segments and keep them in the fridge overnight. Reserve the other half which you can thicken over heat (till it coats the back of a stirring spoon) and pour over the finished tians as a final touch. Dissolve the gelatin in hot water and let it come to room temperature while you whip the cream. In a chilled bowl, whip the chilled cream with chilled beaters for about a minute on low speed. Add the sugar and continue whipping till the beaters start to leave non-lasting trails in the cream. Add the cooled gelatin slowly while continuing to beat the cream. Whip till the cream forms soft peaks. Fold in the orange marmalade. Arrange the orange segments at the base of each ring in a pretty fashion. Remember that this is going to be top part of your dessert. 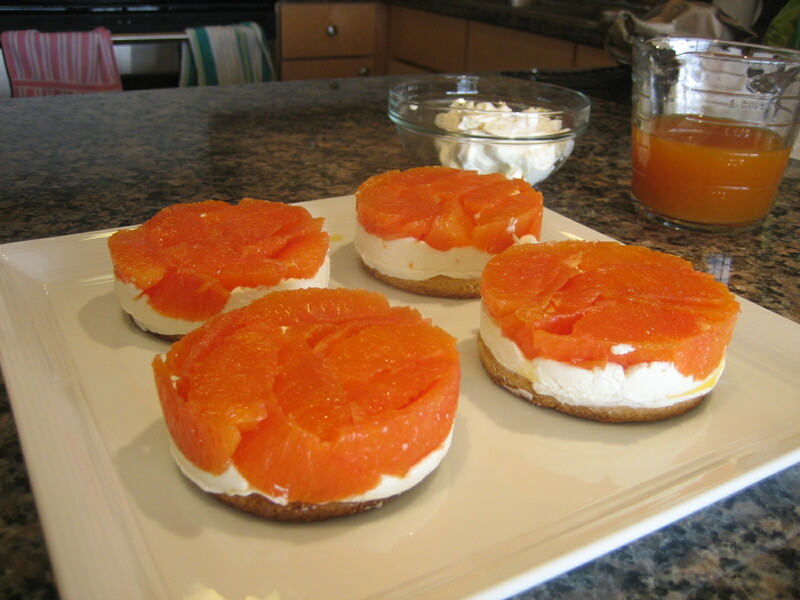 Spoon in a couple of tablespoons of whipped cream into each ring and spread it out evenly. Invert the cookie sheet on another plate of similar size. Remove the ring from the first tian. Admire the fruit of your labor. You must agree that it looks really pretty. Continue to remove the rings. They are ready to reused at this point if you would like to make more tians. The ingredients are enough for at least six tians. 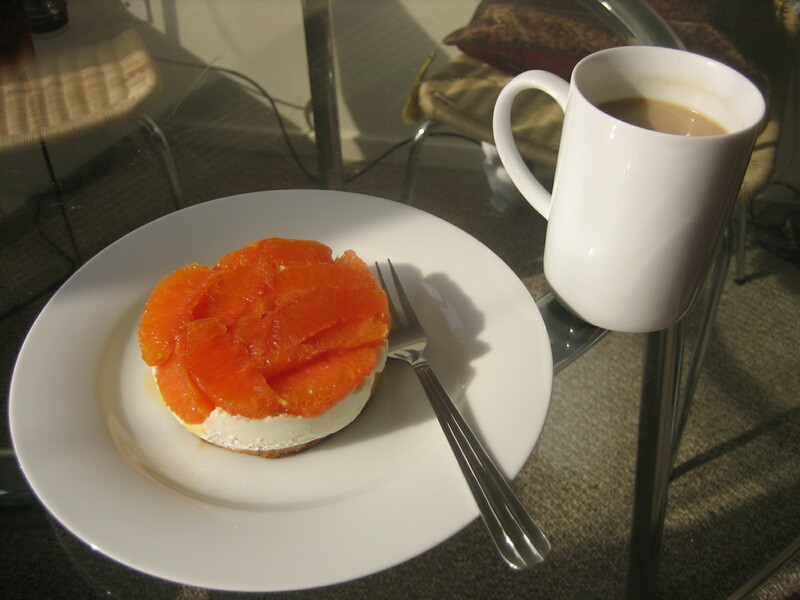 How wonderful to have such a light and refreshing dessert and coffee in the fading spring sunlight. Wow, your oranges look so bright! Did you end up pouring the caramel sauce over the finished product? I took half of one of mine out of the freezer last night to eat but didn’t have caramel sauce. While it was good, I think the sauce added a bit more to it. Great job on your tians! I was actually commenting to a friend of mine about the bright red color that my orange segments turned into after being soaked in the caramel sauce overnight. I think it may be because I overheated the caramel or something. I didn’t pour much of the rest over it because I didn’t have the time to thicken it till it was viscous enough to coat the back of the spoon.